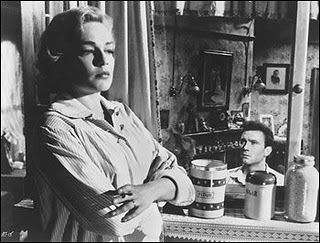 Easily the Best Actress of 1959: Simone Signoret in Room at the Top (1959) - with Laurence Harvey in the background. The foreign films were in full force. They were coming from Sweden, from France, from Italy, from Russia, from India. Major directors, who had been major forces in their own countries for years, were finally getting international attention, finally attracting the attention, not only of the French critics, but also the U.S. critics as well. Film History: The 400 Blows is released, kicking off the French New Wave. The Academy of Motion Picture Arts and Sciences drops its non-Communist rule, essentially ending their approval of the Blacklist. 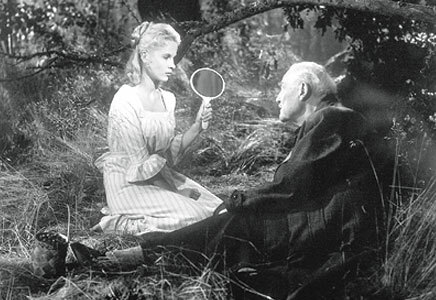 Janus Films becomes a major Foreign film distributor in the United States, most notably with Wild Strawberries. Cecil B. DeMille dies in January, Preston Sturges in August and Errol Flynn, at age 50, in October. On 1 January, Alec Guinness becomes Sir Alec Guinness. All Elizabeth Taylor films are banned in Egypt due to her financial support of Israel. The World of Apu is released in India, completing Satyajit Ray’s Apu Trilogy. Ben-Hur, at $15 million becomes the most expensive film ever made, but also becomes the second biggest film of all-time, grossing $74 million. Academy Awards: Ben-Hur establishes itself as the supreme Oscar winner, taking home 11 awards in all (only missing out on Adapted Screenplay). On the flip side, Anatomy of a Murder and The Nun’s Story become the first pair of films with 7+ nominations to go winless since 1942. Art Direction joins Cinematography and Costume Design, again splitting between Black-and-White and Color films. With that, we end up with 35 different nominated films and with Ben-Hur dominating, only 8 films win an Oscar for a very low percentage of 22.86% of the nominated films, the lowest year between 1951 and 1966. Ben-Hur wins Best Actor and Best Supporting Actor, something which won’t happen again until 2003. It also becomes the only film to win every existing technical award (other than the distinctions – the black-and-white and musical categories), though it does become the first Best Picture winner not to win a writing award since 1949. It is the first Best Picture winner to win Special Effects (and the first to be nominated since 1942), something that does not happen again until 1994, when it has been split into Visual Effects and Sound Effects Editing. Overall, they don’t do so bad. The Academy does nominate The Nun’s Story for eight awards, including Picture, Director and Adapted Screenplay, but it had similarly been nominated by other groups. They manage to give Some Like It Hot 6 nominations, including Director and Adapted Screenplay, but somehow don’t nominate it for Best Picture. The arrival of the great Foreign films is reflected in the Original Screenplay category with first time nominations for both Francois Truffaut for The 400 Blows and Ingmar Bergman for Wild Strawberries. Yet, pathetically, both of them (and North by Northwest) lose to Pillow Talk. The great performances in those films, however, are passed over for the likes of Doris Day and the supporting performances in Imitation of Life. Golden Globes: Five films earned nominations for Best Picture and Director: future Oscar nominees Ben-Hur, The Nun’s Story, Anatomy of a Murder and The Diary of Anne Frank, as well as On the Beach. Ben-Hur took home both awards while Some Like It Hot won for Comedy and Porgy and Bess for Musical. Room at the Top had to settle for a single nomination for Actress, which it lost to Suddenly Last Summer. Not a single one of the acting winners ended up with Oscar gold and half of them – Marilyn Monroe, Anthony Franciosca and Stephen Boyd failed to even Oscar nominations. Awards: The Nun’s Story was the big winner from the critics, taking Best Picture, Director and Supporting Actress from the National Board of Review and Director and Actress from the New York Film Critics. Ben-Hur took home Best Picture from the NYFC while also taking home the Directors Guild Award and Best Picture at the BAFTA’s. The other big BAFTA films were Sapphire, a British film that took home Best British Picture and The Nun’s Story which took home Best British Actress among its four nominations. The Writers Guild Award was split between The Diary of Anne Frank, Some Like It Hot and The Five Pennies. 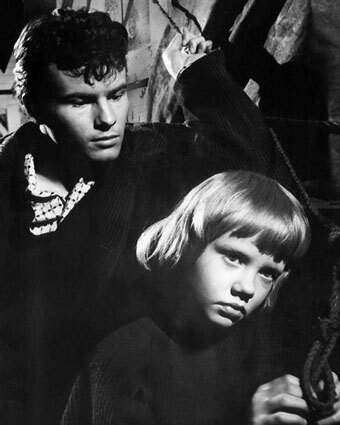 1 – Hayley Mills was one hell of an actress. Because Mills became famous in the States for her performances in Disney films like Pollyanna and The Parent Trap, she is mainly thought of as a sickly sweet innocent girl without a whole lot of dramatic range. In fact, Mills was an accomplished actress and in Britain over the course of a decade produced remarkable performances in Tiger Bay, Whistle Down the Wind, The Chalk Garden and The Family Way. There was so much more to her, even at a young age, than American audiences ever realized. In Tiger Bay, her film debut, at the age of 13, she plays the young girl who becomes the witness to a crime and then tries to protect the older man she has fallen for and almost dies because of it. 2 – Horst Bucchholz’s ability to project rage was never properly appreciated. Buchholz is probably most famous in the U.S. for his roles in The Magnificent Seven and Fanny, but neither came close to showing how good an actor he was. In his native Germany he starred in The Confessions of Felix Krull, a film that explored his dramatic and comedic range. That range, combined with the explosive anger he had showed in Tiger Bay and Fanny, was perfectly used later by Billy Wilder, casting him as the angry young Communist in One, Two, Three, the straight man to all of Jimmy Cagney’s great lines. It was Tiger Bay though, that showcased his acting the most, with his trapped young man desperate to find a way out. 3 – John Mills, like other British actors, namely Jack Hawkins and Anthony Quayle, might have been properly noticed in England, but never received his full due in the United States. It is true that Mills, who was my grandmother’s favorite actor, eventually won an Oscar for Ryan’s Daughter. But by then he had already been vastly overlooked in a great career that had included strong performances in This Happy Breed, Ice-Cold in Alex, Tiger Bay, Tunes of Glory and The Chalk Garden. Forever thought of in America as the wimpy Pip in Great Expectations, Mills was a leader on-screen, as capable of playing an officer as an enlisted man, at ease in any role. In Tiger Bay, he had the first opportunity to act opposite his daughter and he is fantastic as the police superintendent trying to solve the crime and get the confession. This relationship with his daughter would also extend to The Chalk Garden and The Family Way, where he finally got to play her father on-screen. 4 – There are a number of great British films that were nominated for numerous BAFTA awards that are extremely difficult to find in the States. Films like Tiger Bay, Whistle Down the Wind and Ice-Cold in Alex, all first-rate films, all films with numerous nominations, all films worth seeing with these great British stars, are hard to find. There really is no reason for this. Most of them are widely available in Britain. So if you are British and you think, “Hey, Tiger Bay isn’t over-looked,” well, in the States it is. 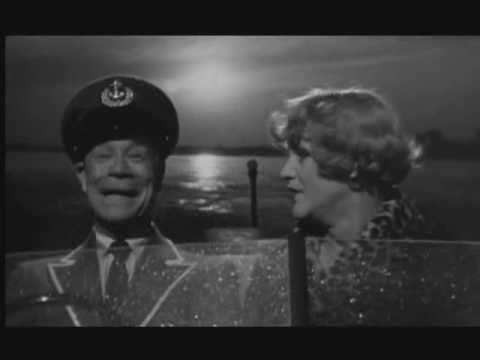 Some Like It Hot’s ending made me cry from laughing so hard. No Best Picture nomination? Come on! Just out of curiousity, where does Rio Bravo rank? North by Northwest is my favourite of this year. I love that movie. Andrew, I gotta agree with you; that ending is one of the greatest movie endings out there. Hilarious. What did you think of Juanita Moore and Susan Kohner? I thought they did an outstanding job making me care about their characters in Imitation of Life and their performances as the saintly black mother and rebellious strong willed daughter really drew me into the characters world. I would have voted for one of them over Shelley Winters in a heartbeat because she had next to nothing to do in Anne Frank. I think that’s why they canceled out, because they both deserved it like the supporting actor trio in On the Waterfront.